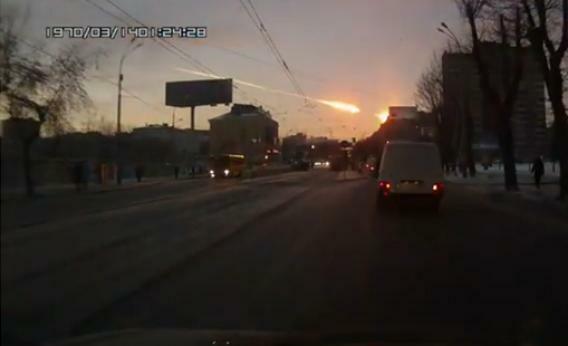 Russian meteor: Why didn’t we know it was coming? Why Didn’t We Know the Russian Meteor Was Coming? We’re getting better at spotting potentially dangerous objects, but this one was too small. Could anyone have seen the meteoroid coming? Thomas Pynchon said it best, years before: “A screaming comes across the sky.” Midmorning today, near the city of Chelyabinsk in western Siberia, a meteor came in from the northeast. (Phil Plait has compiled many videos and pictures of the stunning event.) The meteor burned brightly and created a powerful shock wave. Nearly 1,000 people were injured, according to wire reports, and a 20-foot crater has been found in the town of Cherbakul. If those estimates are in the right ballpark, it was probably too small to have been seen with present methods. However, these techniques have been improving rapidly. A study released last year by NASA found that there are roughly 5,000 “potentially hazardous asteroids” 100 meters (330 feet) or larger whose orbits come near Earth’s. NASA released this rather scary-looking diagram of Earth’s orbit passing through the PHAs. (Because the PHAs are themselves moving, the situation is not quite as dire as the diagram makes it look.) A similar diagram showing objects the size of the Chelyabinsk meteor would be even scarier though. There are many, many more small near-Earth objects than large ones. NEO is another acronym devised to get around the fact that none of the plain English words—asteroid, comet, meteor, meteorite, and meteroid—exactly describe space objects that pose a danger. The same methods that astronomers use to search for larger objects, as they have been refined, make the threshold of detection smaller and smaller. The good news is that, in the last 20 years, astronomers have gotten far, far better at discovering PHAs. This NASA chart from January of this year illustrates the dramatic increase in knowledge. We now track nearly 100 times more PHAs than we did in 1993. Up until the late 1990s, the only people looking systematically for such hazardous objects were a group at the University of Arizona called Spacewatch, which has been around since 1980. Spacewatch was a pioneering group: They were the first to really take the threat seriously and were also methodological pioneers. Astronomers’ most powerful telescopes, because they tend to have narrower fields of view, are poorly suited to the task of scanning the sky for danger. Normal, small telescopes—Spacewatch uses 0.9 meter and 1.8 meter telescopes—can do the job reasonably well, so long as they are coupled with capable detectors and software for automated scanning of the sky. From 1985 to 2009, Spacewatch discovered just under 2,500 PHAs. The number they found increased dramatically as the technologies they relied upon—electronic detectors and computer software improved in the late 1990s. But the real revolution in discovering PHAs came when NASA and the Air Force began to take the threat seriously. In early 1996, LINEAR, a joint NASA-Air Force program run by MIT’s Lincoln Labs, started field tests on a pair of telescopes at the White Sands Missile Range in Socorro, N.M. LINEAR’s telescopes are 1 meter in size—similar to Spacewatch’s—but LINEAR uses what the Air Force describes as “highly sensitive digital camera technology, known as Deep STARE.” LINEAR has sent more than 231,000 discoveries of new objects to the Minor Planet Center (a body in Cambridge, Mass., with responsibility for keeping track of things in the solar system.) The vast majority of LINEAR’s discoveries were of distant asteroids and other objects which pose no danger to Earth. About one-third of the PHAs known today were found by LINEAR. LINEAR accounted for the bulk of new discoveries in the late ’90s and early 2000s before being overtaken by the Catalina Sky Survey, another NASA-funded effort at the University of Arizona. Catalina and Spacewatch have informally divided responsibilities—Spacewatch focuses on better determining the orbits of objects that are already known, while Catalina focuses on finding new hazards. All of these programs used roughly the same technique—take many pictures of the sky and look for things that move. NEOWISE, a systematic space-based effort to scan the skies for danger in 2010 and 2011, used the same basic idea, but had several advantages. Unlike the ground-based telescopes, which take pictures in the visible spectrum, NEOWISE used an infrared telescope. As NASA explains, “optical telescopes observe reflected sunlight so they cannot easily tell the difference between a small bright object and large dark object.” Infrared telescopes can thus better estimate the crucial question of how big potentially dangerous objects in space are. WISE, the telescope part of NEOWISE, was launched in 2009 and hadn’t even been intended to hunt for hazardous objects. Its purpose was just to comprehensively scan the sky in the infrared spectrum, looking for luminous galaxies; finding new, dim stars; and doing basic astronomy research in how planets form. After its main mission ended, astronomers realized they could use the 40-centimeter telescope to search nearby in the solar system. Because it is based in space, the NEOWISE mission can search more of the sky at once than ground-based detectors. Comparing how many such objects it found with the number of objects that had already been discovered from the ground let the NEOWISE scientists at NASA’s Jet Propulsion Laboratory in California estimate how many “unknown unknowns” are out there. They estimate that only 20-30 percent of large (that is, bigger than 100 meter) PHAs have been found already. As for the smaller ones, the numbers are much larger. Events like today’s Siberian blaze are actually common. A similarly sized rock blew over Western Canada in November 2008, entering the atmosphere just east of Lloydminster. “Tens of thousands of people … saw it streak across the sky, saw its arc-welding blue flash, or heard the subsequent explosions,” a news report from the time said. But Twitter and YouTube weren’t so widely used then, and no one was reported injured, so it didn’t create the same international sensation. Something on the order of 10 fireballs of the size of the 2008 Canadian one—a bit smaller than today’s Russian fireball—occur every year. We just don’t see all of them. Many, for instance, fly over oceans. It is probably not cost-effective to mount a large effort to track and develop the ability to deflect small space rocks like today’s. But such objects can serve as a wake-up call that more must be done to find and deal with their larger, rarer, and potentially far more hazardous brethren.